This page is a guide on the procedures of the different types of portraits I offer - every assignment is unique so the procedures may vary. All portraits can be purchased as prints or merchandise. For prints, I use fade-resistant (archival) printing method on textured acid free paper stock 320gsm. Other options such as stretched canvas is also possible. Order processing and printing takes between 2 to 3 weeks for each assignment. This option is for those who wish to have your photo transformed into a piece of stylized art! For this assignment, my client sent me the following photo to work with. It was a gift for her friend and she wanted me to incorporate her friend's dog in the portrait. I proceeded to work on the sketch. My client was happy with the sketch so I went ahead with the colour. Once my client was satisfied with the final artwork, I could send it for printing. For this assignment, my client couldn't find a nice family photo with a decent backdrop, so she sent me a number of photos and asked for my opinion. She mentioned that any background that doesn't look 'boring' would be fine. It was meant to be a surprise wedding anniversary gift for her husband so she'd also wanted the word 'Happy 13th Anniversary' added. I thought this photo looked great and suggested a beach for the background since she told me they lived in Hawaii. She was happy with my ideas with two requests - 1) to have her hair down so she'll look more 'girly' :) and 2) Artie (their brown dachshund) to be looking in front. I proceeded with the sketch - incorporated their names and the word 'Happy 13th Anniversary'. Later she sent me some photos of the beach near where they lived and I was able to use those for reference for the background. This is option is for those who adore my existing artworks and wish to customise the background colour and the 'look' of the couple. To see the artwork selections ---> HERE. This option does not allow the change of the characters' posture or physique in the artwork. If you would like them to be taller/ shorter or chubbier/ skinnier, additional fee applies. For this assignment, my client had chosen this particular piece from the collection. She sent me some photos for reference and the names/ date to be included. 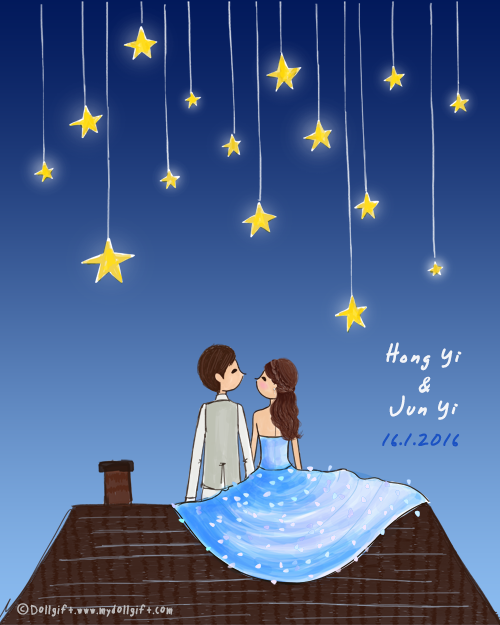 The theme of her wedding was stars/ gold/ blue, so I worked on a few colour options for her. Here's the final artwork she chose! This option is best for those who wish to have a portrait fully customised to your story! 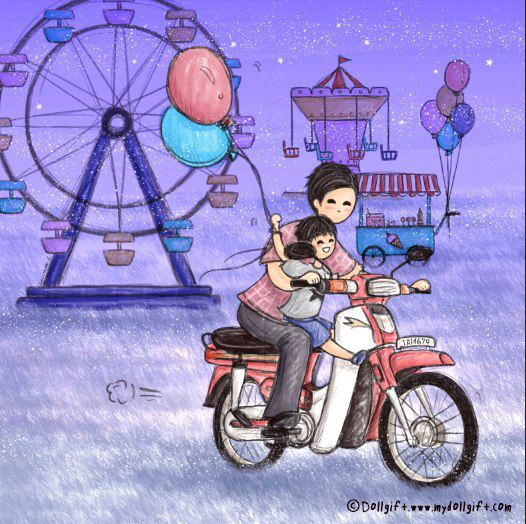 For this assignment, my client wanted an illustration of a childhood memory she had with her dad. 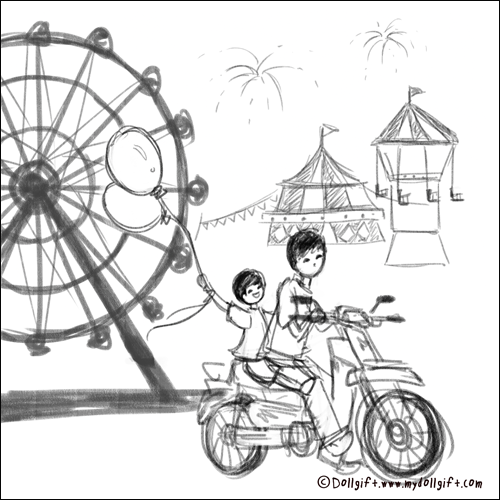 She sent me some photos along with these keywords to work around - ferris wheel, motorbike, badminton and/or rambutans. I gathered more details from her eg. model of the motorbike, type of house, etc. For exclusive orders, I'll create a few ideas for my client to pick from - usually 3, sometimes more but it really depends on individual cases (see Scenario 2 below). I sent her the following ideas/sketches. My client will then select one design - in this case, she'd chosen the 4th one. I proceeded to work on the illustration and added the details. After showing her the finished artwork, she requested to have - 1) one of the elements in the background removed to simplify the art piece, 2) Slight changes to the characters' hairstyles, 3) Car plate number to be added. Final stage - Colour variations. So here you go! This was how the final piece looked. For this assignment, my client shared that she would be moving to another country for a few years with her husband and wanted me to create a portrait for her family (including their 3 cute dachshunds!). By the way, this was her 4th commision portrait so she's very familiar with my working style (thank you!). Her idea was to have a globe showing the continent of North America and Asia with one of them holding the USA flag and the other a South Korea flag. She was unsure about the scenery but thought the view/placement of the characters in the 1st portrait I did for her was nice. I suggested blending the 'map' into the sky to soften the mood instead of having a globe. I also suggested a pier scenery while keeping the positioning of the characters as she wanted. I thought a sunrise setting would be a nice symbolism to their new beginning/adventure. She loved the ideas and I proceeded with the sketch. My client loved the artwork and required no amendment, so I proceeded with the colour variations. She wanted her husband to be wearing a blue tee and her pink. She loved the first colour. Again, no changed needed so here's the final piece she'd chosen! I hope you have a better understanding of how I work now. So if you're ready to order your portrait, go to my Order A Portrait page!